The town sawmill was the heart of all timber town’s. Our sawmill contains ten operating engines all powered by our large steam boiler. Operates daily during school holidays and periodically during our low season. 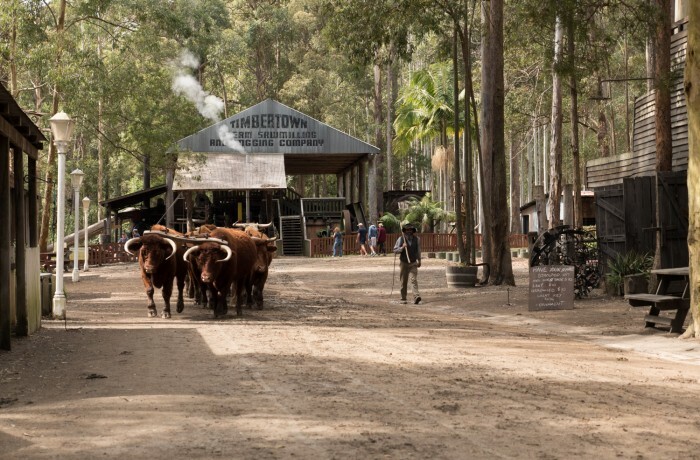 The Timbertown sawmill and much of its equipment was originally built and located on the Allyn River at the foothills of the Barrington Tops. The mill opened in 1943 to process timber close to its source and ceased operating there in December 1970. It was purchased by Timbertown and reassembled within the park as a fully functional mill in 1977 and has been lovingly maintained to full operational order ever since! Stand in the mill and close your eyes. You will be transported back in time by the clang of the steam engine which drives the mill, the shhhhhush, shush of the belt drives and the whir of the saw blades. The sawmill is at the heart of the Timbertown experience and is a favourite experience for all ages.